Synonymous with love, healing and protection, this enchanting crystal suggests you may find yourself feeling very drained by the people around you this week. Constant whining from friends and loved ones - and unnecessary drama around you - may leave you feeling very frustrated, and there could be some tension between you and a colleague or loved one too. Protect yourself from their negativity by keeping an Amethyst in your home. Known as a stone of love, healing and compassion, this mesmerising crystal has bewitched people’s hearts and minds for centuries, and is thought to be one of Kate Hudson’s favourite crystals. Thought to fill our hearts with love and positivity, it suggests the bond between you and a friend, love interest or family member could become much stronger this week. Nurture the love and trust between you by placing a Rose Quartz by a photo of you together. Prized for centuries, this stunning crystal suggests you may find yourself feeling slightly unsettled by a friend or loved one’s overly-confident behaviour this week. Rude or arrogant remarks from the people around you - and attention seeking behaviour from friends and colleagues - may leave you feeling very annoyed, and there could be a fiery exchange between two people around you too. Wave their negativity goodbye by keeping a Ruby in your home or work place. This beautiful crystal has enchanted the world with its magical properties for centuries, and is thought to be one of the most valuable crystals in the world. Encouraging us to see and appreciate our own beauty and value, it suggests you may need to distance yourself from a friend or loved one who’s always putting you down - or criticising your behaviour - this week. Keep your spirits high by placing a Beryl crystal in your home or work place. Synonymous with the sea and water, this captivating crystal suggests you may find yourself feeling slightly tearful this week. Unreasonable demands from friends, bosses and family members may leave you feeling very drained, and you may find yourself feeling very irritable with the people around you too. Calm your heart and mind - and cast your worries aside - by keeping an Aquamarine in your home or work place, or keeping one with you each day. Symbolising love, friendship and protection, this spellbinding crystal suggests you could hear some exciting news about a friend this week. Pregnancies, engagements and unexpected travels abroad are all likely, and someone you love and trust could surprise you with a very thoughtful gesture too. Celebrate all the love and happiness around you by keeping a Turquoise crystal in your home or work place. Known as a stone of healing, rebirth and transformation, this stunning crystal suggests you could hear some very exciting news about a friend, family member or loved one this week. Engagements, pregnancies and promotions are all likely, and someone you love could surprise you with a very thoughtful gesture too. Celebrate all the love around you by keeping a Charoite in your home or work place, or holding one by your heart. 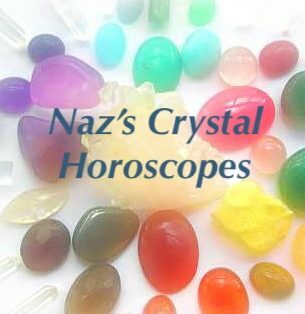 This enchanting crystal has captured the hearts of everyone - from jewellers and healers, to artists and writers - since the 13th century, and is often associated with the Sumerian Goddess of Knowledge, Nisaba. Like this clever goddess - who was renowned for her wisdom and knowledge - this stunning crystal suggests you may find yourself feeling very inspired by someone around you this week. Nurture the bond between you by keeping a Rhodochrosite close by. Known as the stone for ‘healing the healer’, this beautiful crystal suggests you may need to spend some time loving, honouring and obeying yourself this week. Overwhelming demands from friends and loved ones may leave you feeling very frustrated, and you may find yourself feeling slightly low and lethargic too. Calm your beautiful heart and mind - and leave your worries behind - by keeping a Peridot in your bedroom, or simply holding one by your heart each night. Once thought to be the sacred tears of the sun, these stunning crystals have captivated the world with their beauty for centuries. Symbolising love and healing, it suggests you may find yourself missing someone very special from the past this week. Vivid dreams about the people you’ve lost - and deep and meaning conversations with friends and loved ones - may leave you feeling very nostalgic, and there could be some unexpected news about an old friend too. Bewitching the world with its magical powers for centuries, this mesmerising crystal suggests you may find yourself feeling slightly emotional this week. Happy memories from childhood - and conversations with family members about days gone by - may leave you feeling slightly tearful, and a heartwarming message from someone you love could really pull at your heartstrings too. Nurture the bonds around you by keeping an Emerald in your home. Thought to be one of the best crystals in the world for helping you lose a few pounds, this stunning crystal suggests you may find yourself feeling very drawn to a new health or fitness regime this week. Insightful conversations with friends and loved ones may leave you feeling very inspired, and you may find yourself feeling very positive about the future too. Boost your willpower by placing an Apatite in your home, or simply keeping one with you each day.